To achieve stable and sustainable prices for community coffee lots through improved quality control, shared knowledge, and a connection to the specialty coffee market. Red in Spanish means network, representing the producers and roasters working together to create a sustainable value chain. At present, families are faced with the option to sell their washed coffees in wet form to drying station intermediaries. In the past, they would dry their own coffee for sale on the commodity market; not for a high or predictable price, but capturing a valuable processing step. Wet selling is a situation brought about by climate change, which has worsened an already challenging situation. Rainy seasons continue longer than before, meaning traditional farmer-owned drying facilities are unsuitable. Modernised drying solutions are required, and the cost puts this out of reach for most. This is where drying businesses have appeared as a temporary solution, buying small amounts of wet coffee for very low prices from farmers, and turning them into large lots of dry parchment. The drying station operators sell this parchment coffee to dry mills. The price of this parchment coffee changes daily, dictated by the commodity market and coffee’s physical characteristics. The unpredictable sale price forces drying station operators to offer extremely low prices to farmers. Through the Red Associations, we build infrastructure needed to give the drying stage back to producers. We then give access to steps traditionally downstream of producers. These include sample analysis, roasting, QC, and separation of lots by value based on quality. Combined, these result in the average income through coffee increasing by 2.5 times. Funding and construction of infrastructure, so farmers can recapture the value-adding steps of production (drying and parchment selection). Providing facilities for processing, QC, and preparation of coffee specifically for the specialty market, managed by Red Association members. Delivering production and farm management system training, focussing on improving coffee quality while controlling costs. Guaranteeing the purchase of coffee for a stable and sustainable price, through a connection with roasters. This system gives farmers a better understanding of the value chain as a whole. Connecting producers and roasters through internships and workshops, allowing the flow of market information in both directions. Through this model, producers have a sustainable reason to invest in quality. 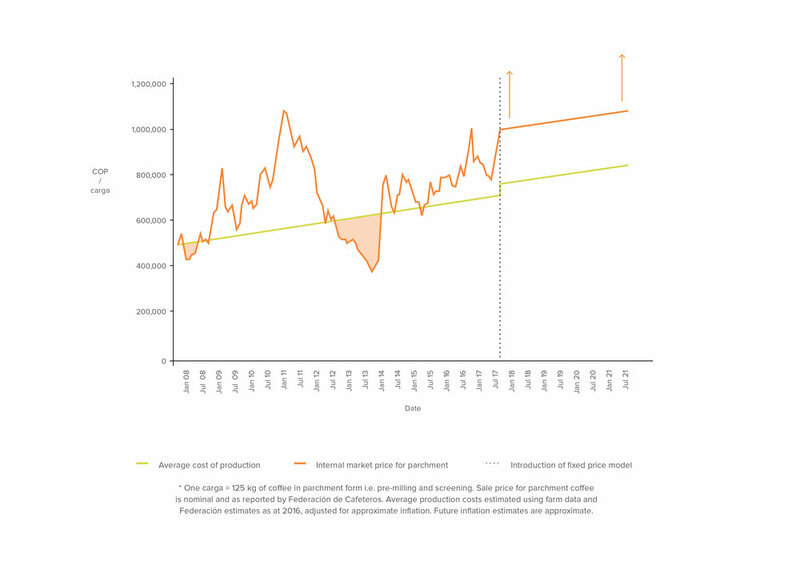 The cost of production vs sales price graph above is in Colombian pesos (COP) per carga, the currency and unit used to trade parchment coffee in Colombia. For a farmer, this shows the cost to produce parchment, and the price it sold for across the last 10 years. On the right, is the proposed future for Red Associations members. As a producer member, the minimum price for parchment is always stable. The orange arrows to the right, represent a price scale above this minimum. This price is for microlots, based on quality and a farmer’s best production practices (an association is a team effort, where individual effort is valued). The graph also accounts for an increase in the cost of production, which corresponds with joining the Red Associations. This is through investment in farming practices such as, higher wages for those who pick cherry, planting shade trees, and other practices that increase the quality of production. Therefore, increased costs are accounted for through the increase in sale price. With the new infrastructure in place, we can ensure high quality is achieved, and predict cup profiles throughout the season. Because profiles meets the roaster member's quality expectations, we can guarantee the minimum price the green coffee is sold for. This knowledge allows for a predictable, high prices to be given to producers. For producer members, these changes result in 2.5x the profit generated through coffee, compared with the average income over the past 5 years. Commitment from roaster members is a vital part of the transition, from low-value wet-selling, to specialty market production. Farms that excel, grow rare varieties, and incorporate new processing techniques, can keep their microlots separate from the community blend. Producer members have chosen to offer these coffees first to roaster members before they are made available to other Raw Material customers. Each harvest season an internship opportunity will be offered to founding roasters in the Red Association cupping labs. The interns will help with QC and lab management, all whilst improving their Spanish, and understanding of coffee. These internships maintain a vital connection between farmers and roasters. Alongside this, Raw Material provides ongoing QC and management training for the lab managers and Red Associations members. Agronomy workshops for specialty production are provided by both the RM team and guest consultants.